No, she's not gone. We talk every day. But her fashion legacy has already passed on. I have a tendency to pick through her closets and jewel boxes whenever I visit, and she’s happy to oblige. I usually leave with a Big Brown Bag stuffed with vintage Ralph Lauren and Perry Ellis items of outstanding quality. In the 70’s and early 80’s, Mom wore a lot of fitted shirts with hacking jackets or chunky knit cardigans and midi length dirndls. She also loved simple Modernist silver jewelry with touches of stone or colored enamel. 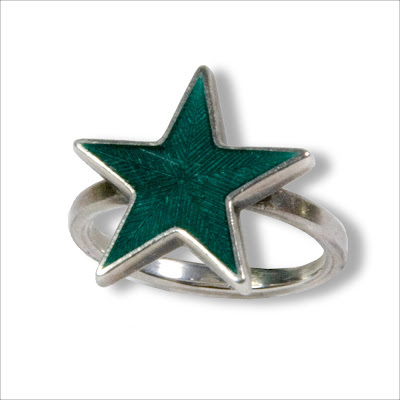 This classic sterling silver Gucci star ring, with Hunter green glass enamel, was something my Mom bought for herself at Gucci on Fifth Avenue, in the early 80's. It just caught her eye and was reasonably priced, so she bought it on the spot. Hallmarked on 3 points under the star are marks for ITALY, GUCCI and 925. I had to adjust the size, which is OK, as long as it's done seamlessly. However, I wouldn't advise polishing a piece like this. Silver acquires a wonderful patina of age that is a large part of the provenance. Here, I instructed the jeweler only to polish the bottom of the shank where he cut the ring down to my size. Right now, I am not feeling the pressure to design or even buy myself a statement piece of glittery costume jewelry, although I admire much of it, as imagined on the runway and artfully crafted in editorial spreads. It just doesn’t suit me. Perhaps the trend seems frivolous, in light of today’s troubled financial times, or perhaps I just prefer the classics. I am, it would appear, more interested in the functionality and longevity of a successful design. This Gucci ring is my statement piece. It’s a part of my family's fashion history - my mother and I have always loved Gucci's signature red and green stripe. The iconic five pointed star design goes with everything. Plus it looks as trendy to me today as it did to my mother almost thirty years ago. Lori Cotler is an amazing vocalist and a dear friend. Her range runs from Jazz standards to South Indian Konakkol, her voice a percussive instrument of rhythmic precision. My favorite is her cover of Nature Boy, but give everything a listen. Lori's music is rare treat. We did an impromtu photo shoot of Lori, one afternoon, and she chose some simple jewelry to wear, from the 18k gold Link Collection. 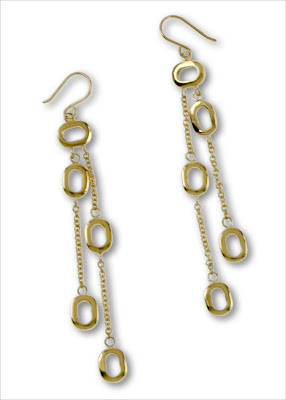 Her favorite item was a pair of delicate chandelier earrings with tiny oval links, pictured above. Lori tells me comfort is essential on stage, and these long , shiny gold earrings are incredibly lightweight and catch the light from a distance. You can see other styles in the gold gallery on CynthiaRybakoff.com, including these one-of-a-kind bluish grey Umba sapphire briolette drops. Cynthia Rybakoff 18k gold cascading link earrings, $1,100, by request at CynthiaRybakoff.com. Spotted on NOTCOUTURE, item #3567, my sterling silver handmade chain with royal purple ribbon ties. The site concept is simple and effective: a visual filtration of ideas + aesthetics + amusements. I recommend frequent visits to check out the latest in international fashion and design trends. This necklace, which can be worn as a belt, is from the Link Collection, which launched in 2005. The entire collection of earrings, bracelets and rings is based on a single beveled link design, inspired by nautical chain. Each piece consists on individually cast links which are polished and connected one at a time. The monotony of pure silver is broken occasionally by saturated bursts of semi-precious stone color. You can see select styles in the silver gallery on CynthiaRybakoff.com. Cynthia Rybakoff sterling silver handmade chain necklace with purple ribbon ties, $1,380, by request at CynthiaRybakoff.com.